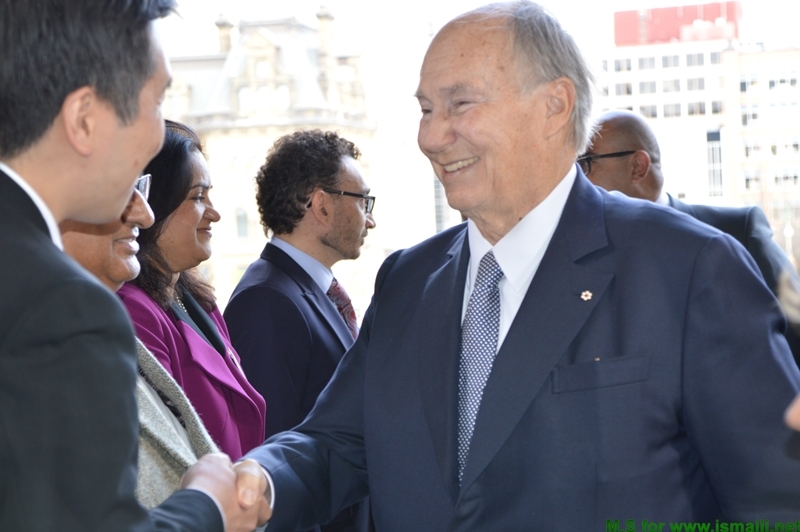 May 19: Toronto, Canada - Annual Pluralism Lecture 2016 - Justice Albie Sachs,formerly of the Constitutional Court of South Africa introductory remarks by His Highness the Aga Khan and an audience dialogue moderated by David Walmsley, Editor-in-Chief of the Globe and Mail. Join the Centre on May 19, 2016 at 6:30 EST for the live stream presentation via the Globe and Mail. This is on invitation event. Look here for more Webcast Info and link later. 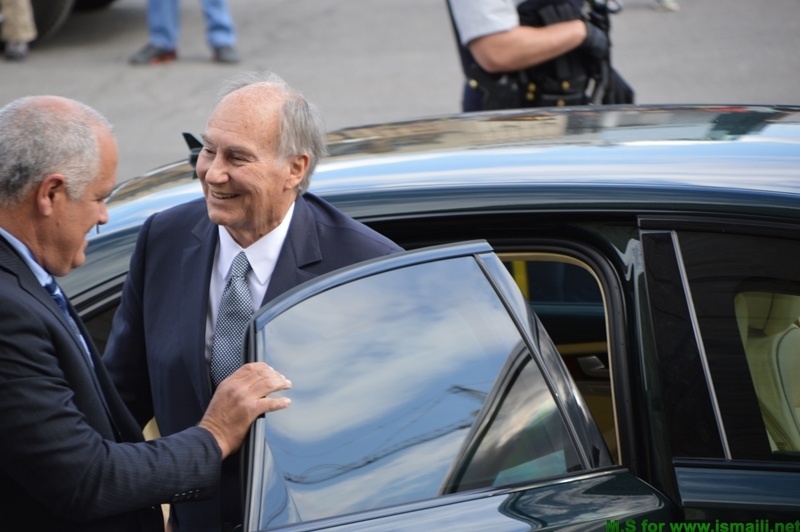 More pics from the arrival and departure of H.H. 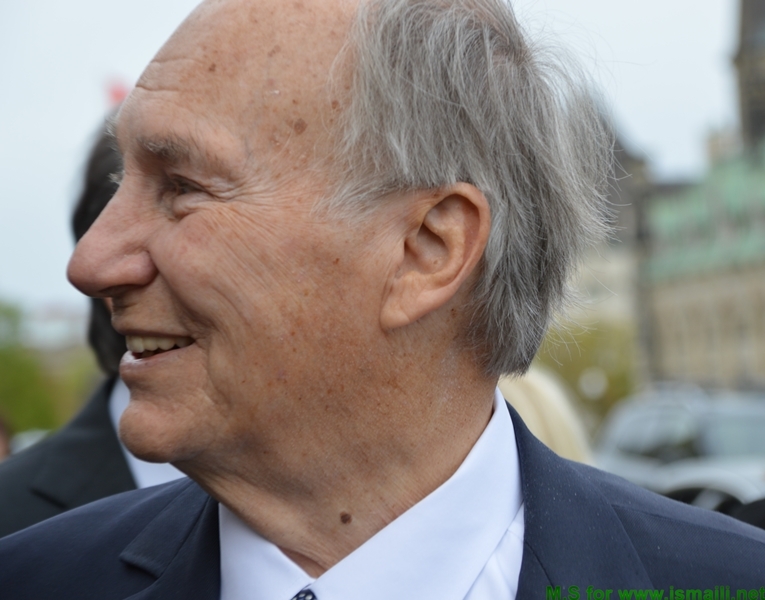 The Aga Khan at Parliament Hill in Ottawa for his meeting with Prime Minister Justin Trudeau from 4:15 to 5pm on 17th May 2016. 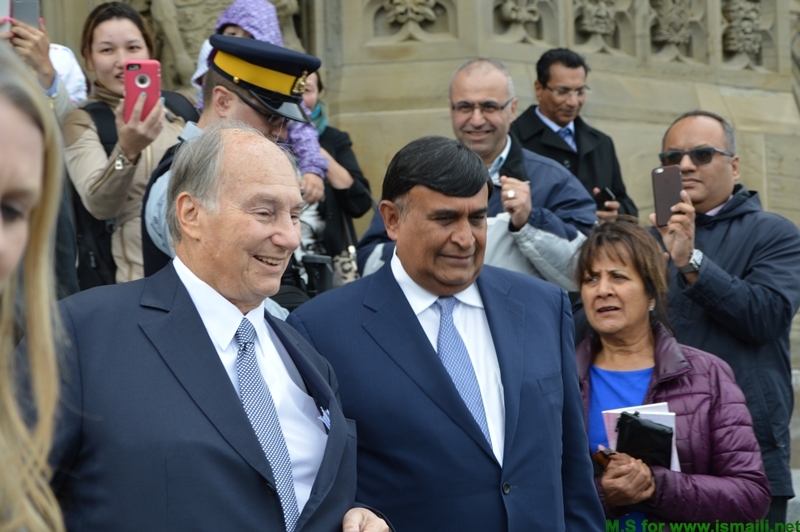 About 50 Ismailis from the Ismaili community were present on the Hill that time. 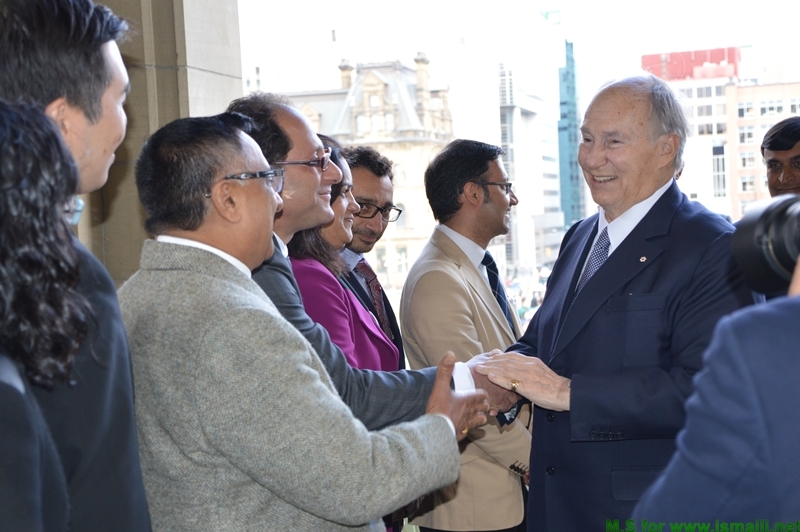 There was a sense of excitement and the happy Imam waved to his Jamat to the delight of all present. 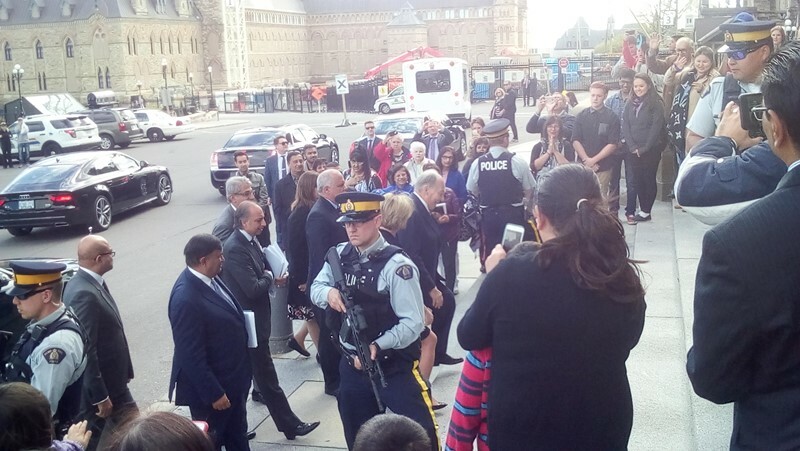 A happy Imam arrives on Parliament Ill where he is welcomed by dozens of his followers. 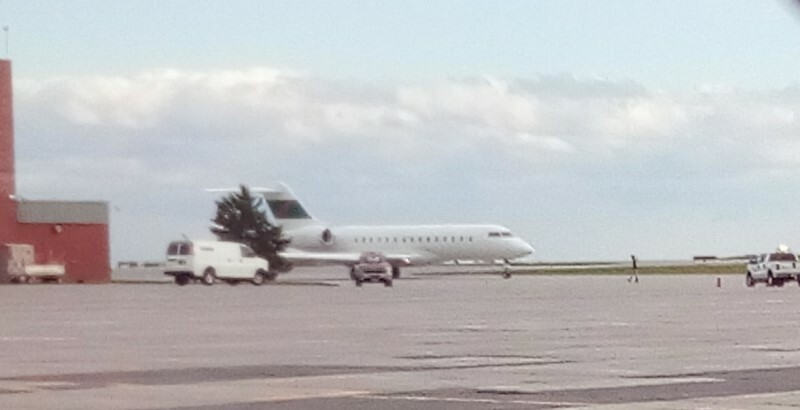 The Imam's plane left Ottawa for Toronto at 5:00pm that 17th day of May 2016. 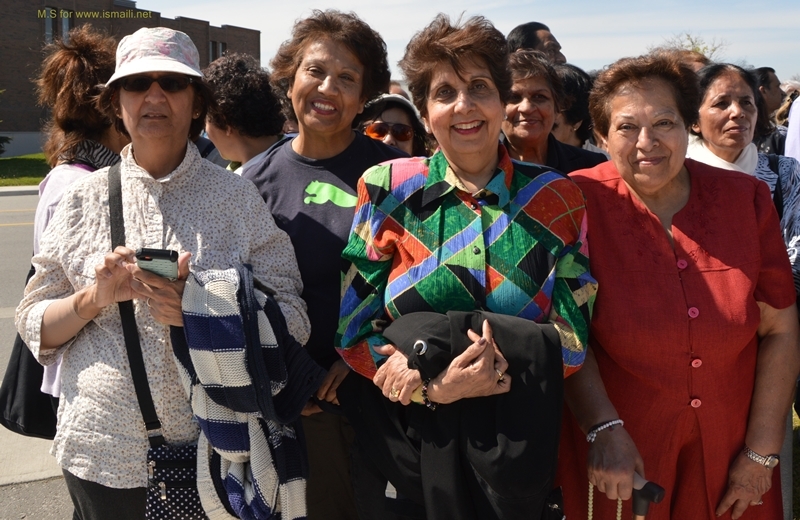 “Your partnership, your help, your support has been extremely important,” said Hazar Imam. 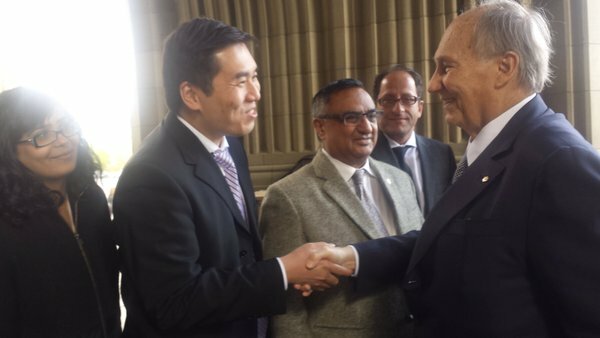 It was their first meeting since the Prime Minister assumed office in November 2015. 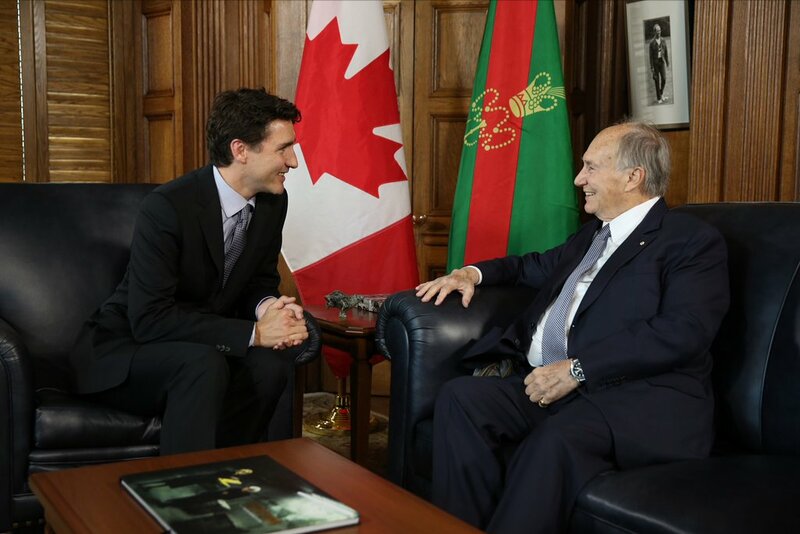 Mawlana Hazar Imam and Justin Trudeau have known each other since the Prime Minister’s childhood, when Trudeau’s father, the late Pierre Elliott Trudeau, served as Canada’s 15th prime minister. 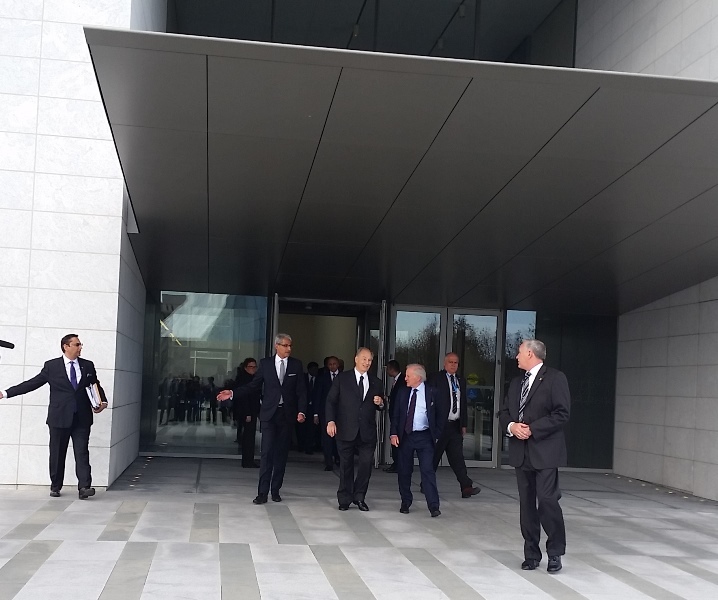 Earlier today Hazar Imam toured the future international headquarters of the Global Centre for Pluralism, which is presently undergoing renovation. 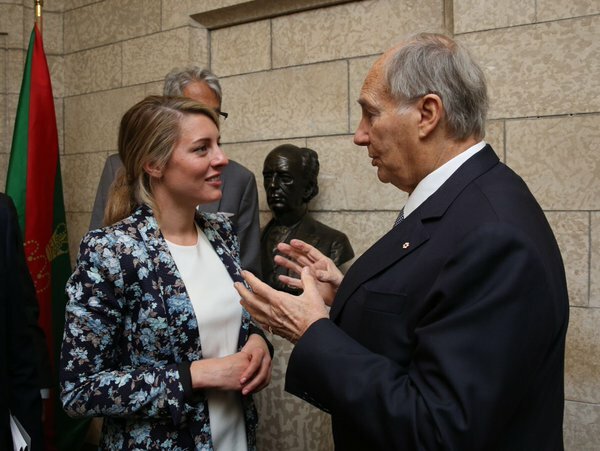 Situated along Sussex Drive in Ottawa, the heritage building — which formerly housed Canada’s War Museum — is due to become the Centre’s international headquarters. 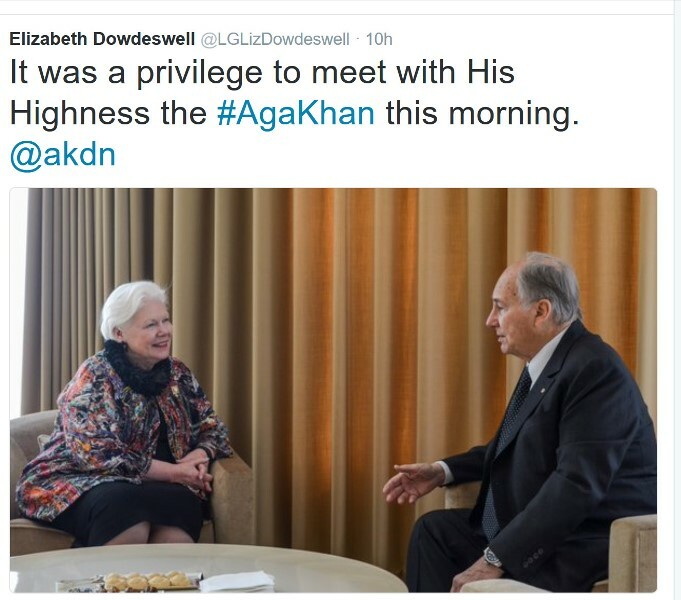 Mawlana Hazar Imam is in Canada to attend various meetings and events in Ottawa and Toronto. 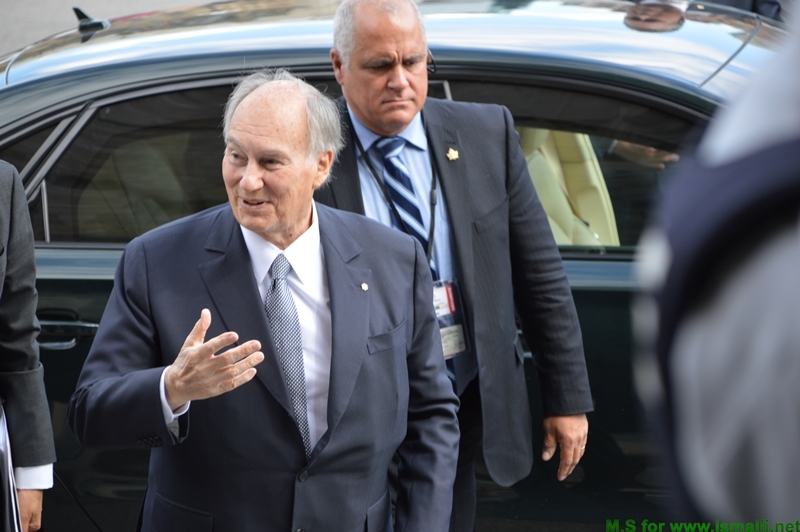 On Thursday he will deliver introductory remarks at the Annual Pluralism Lecture taking place at the Aga Khan Museum in Toronto. 2016, May 17 - H.H. 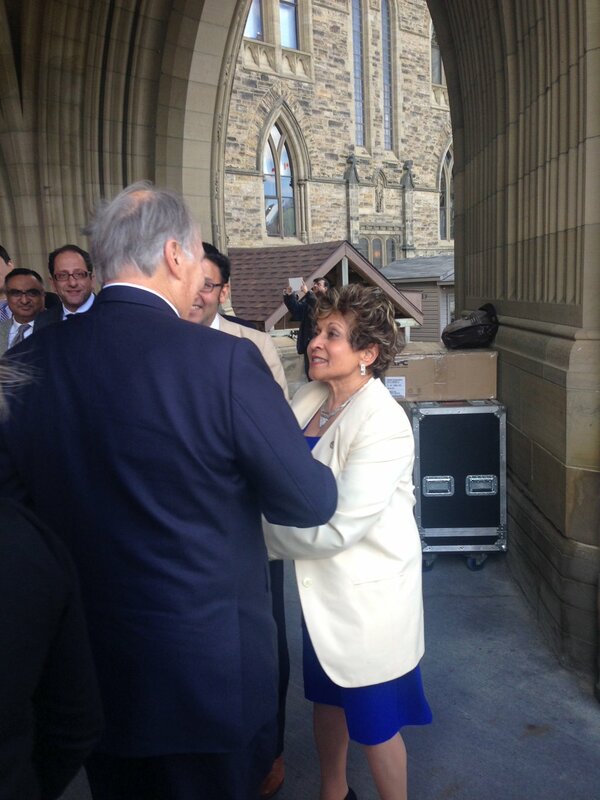 The Aga Khan arrived at 4pm at Parliament Hill to meet the Prime Minister of Canada Justin Trudeau. 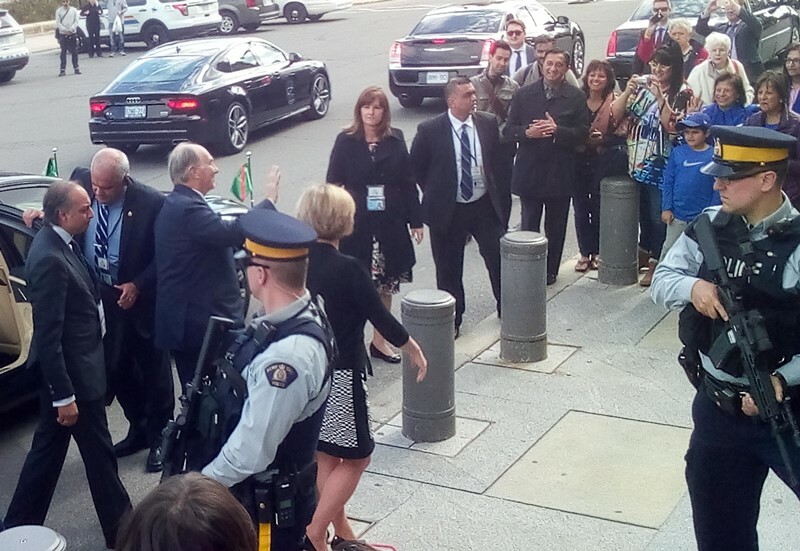 Many of his community were present and he waved to them happily before proceeding to his meeting. 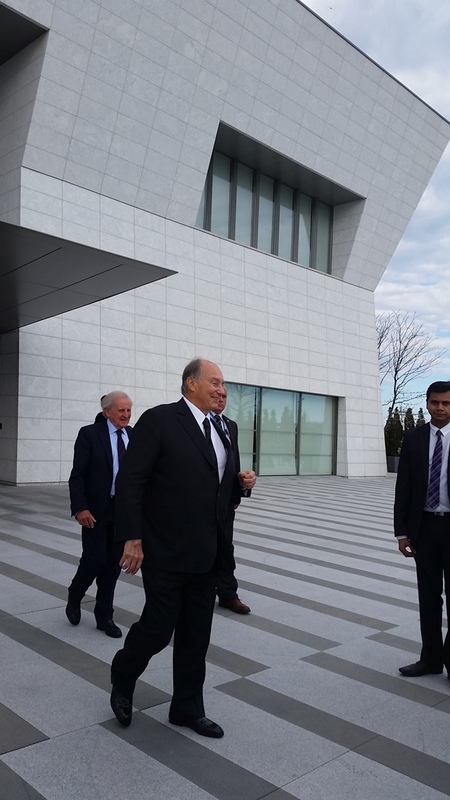 2016, May 18 - Mowlana Hazar Imam left the Aga Khan Museum after a full day of meeting. He walked and passed by the Jamat, giving blessings in a very happy mood. Mubarak to all present! 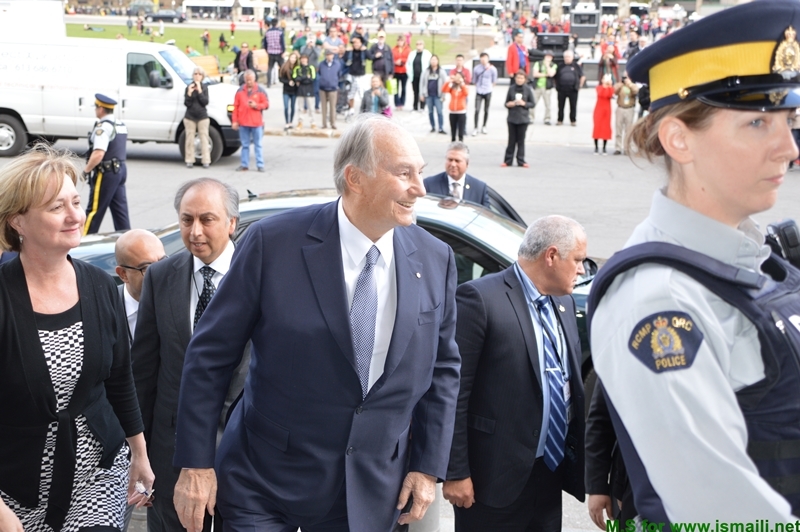 When Mowlana Hazar Imam came out of the Aga Khan Museum around 5:30pm on the 18th of May 2016, at least 2 people showed him the way, that is that the Imam should turn on his right side to the cars. 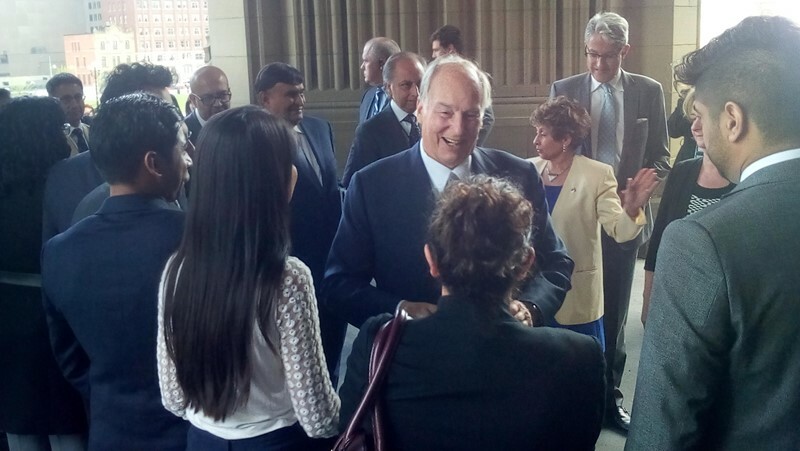 One of the person showing him the way is Talib, the President of the Council. 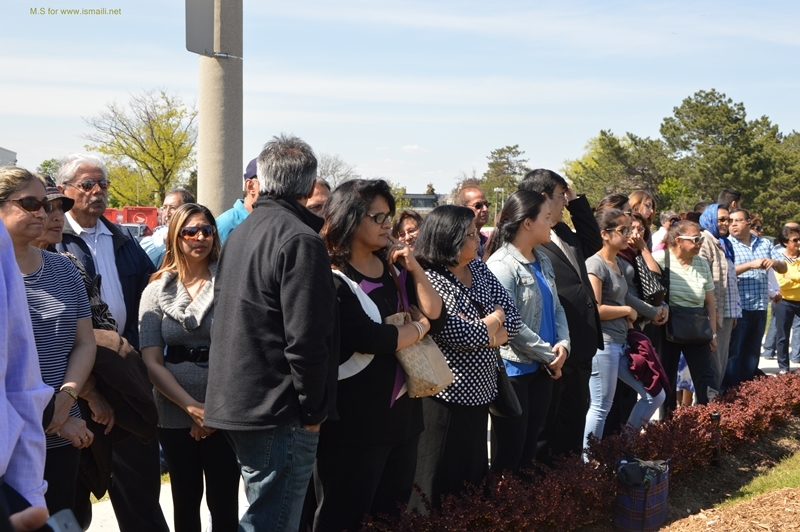 The Imam refused and turn to his left where about 350 Ismailis were anxiously waiting to see their Imam. Mowlana Hazar Imam went to them and keep repeating blessings and Khuda Hafiz with a large smile (Video link after the second photo below. This was reminiscent of what the Imam did in Boston few months back when he was shown the way to his car by security but instead he went to his Jamat and gave us blessings. What a day! 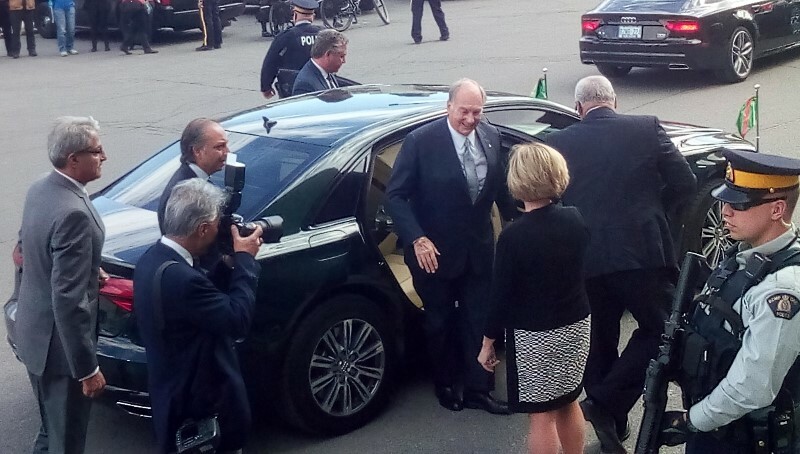 Hazar Imam and our Beloved Prince Aly Mohammad arriving for a reception at York Club in Toronto today May 20, 2016, at 8:10 p.m.
Later he left the York Club. A very beautiful evening. 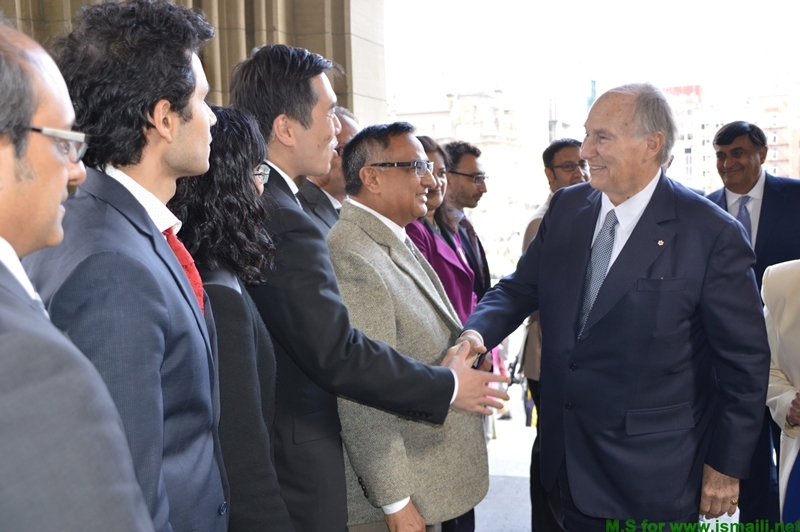 When leaving the reception in his honour, Hazar Imam walked slowly down the stairs, with Prince Aly Mohammad on his right side, holding Hazar Imam's hand. So touching! A murid shouted, "we love you Mawla Bapa", when Mawla looked at the Murids, smiled widely, waved at the murids. 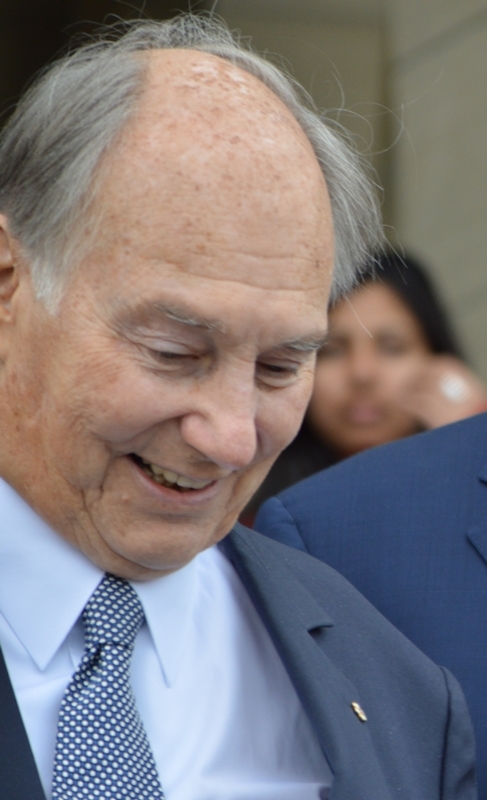 He looked very radiant and very happy. 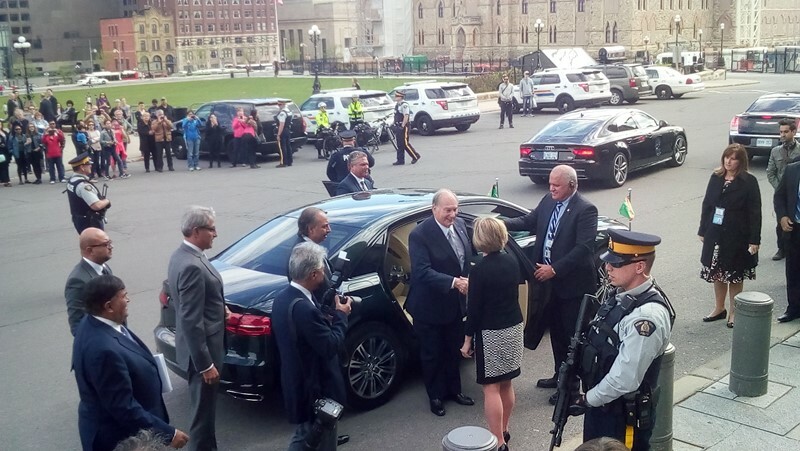 He sat in the right side of his Audi, Prince Aly Mohammad went round and sat on the left and then his car drove away. A very beautiful experience. Shukr. Shukr. 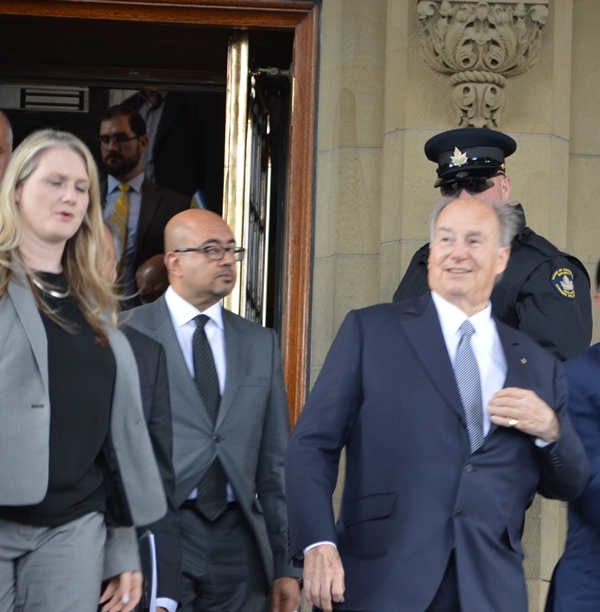 Toronto, 21 May 2016 — Mawlana Hazar Imam and Prince Aly Muhammad departed Canada this morning, completing a busy visit to the country. 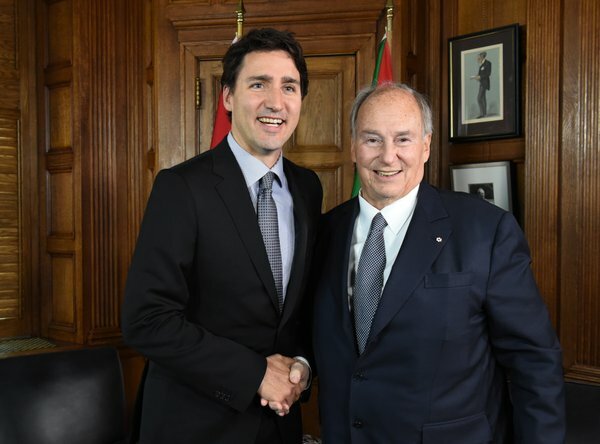 Hazar Imam’s visit began in Ottawa, where he met with Canadian Prime Minister Justin Trudeau and toured the future international headquarters of the Global Centre for Pluralism. 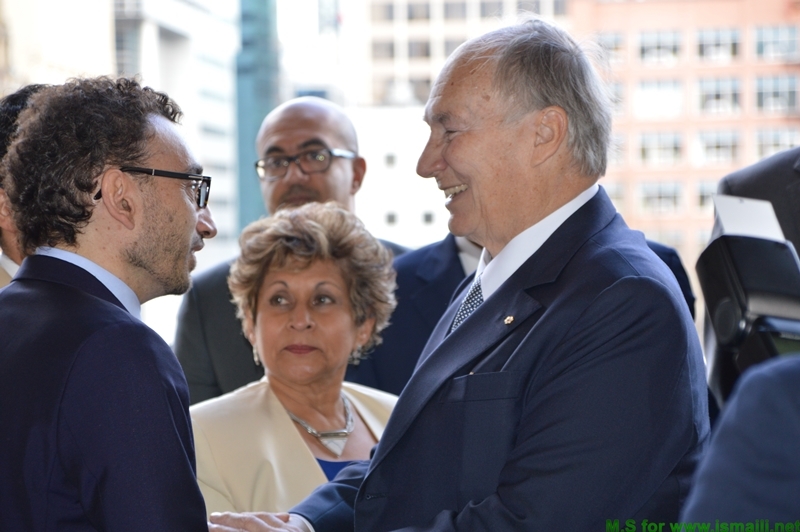 In Toronto, Mawlana Hazar Imam attended the GCP’s Annual Pluralism Lecture, where he introduced the 2016 keynote speaker, Justice Albie Sachs. 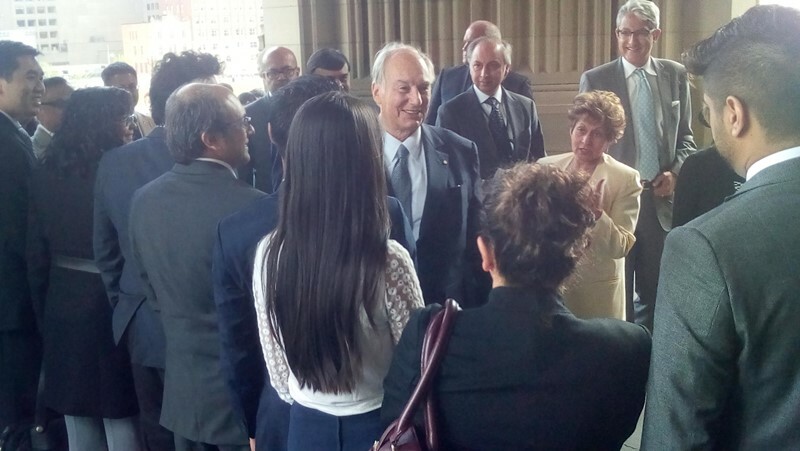 Yesterday evening, Hazar Imam received an honorary degree from the Pontifical Institute for Mediaeval Studies for his service to humanity. 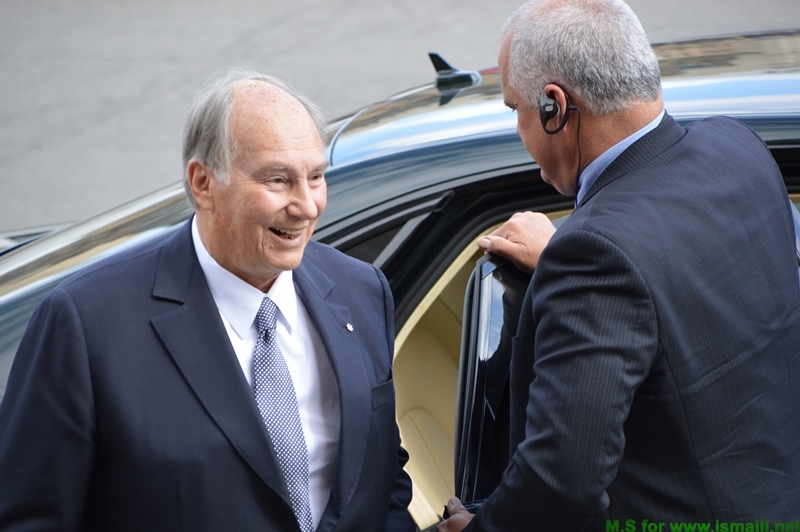 Ismaili Murids waiting outside the Ismaili Center Toronto to have a glimpse of their Imam, H.H. 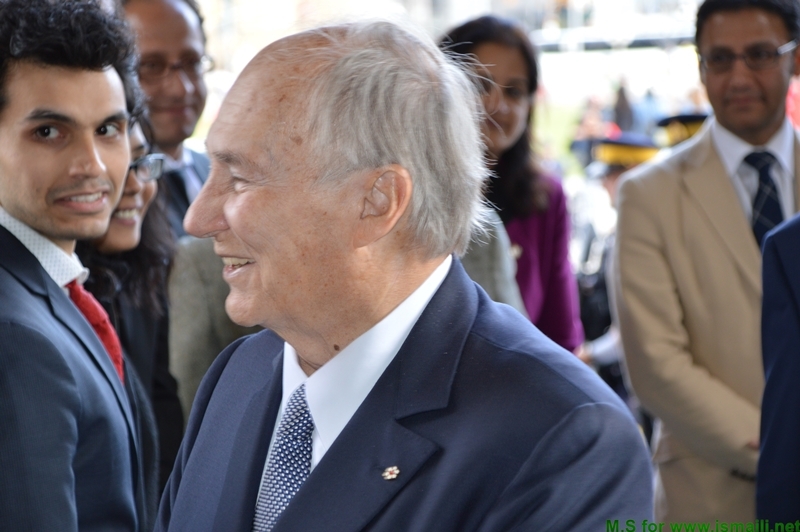 The Aga Khan on 20 May 2016. 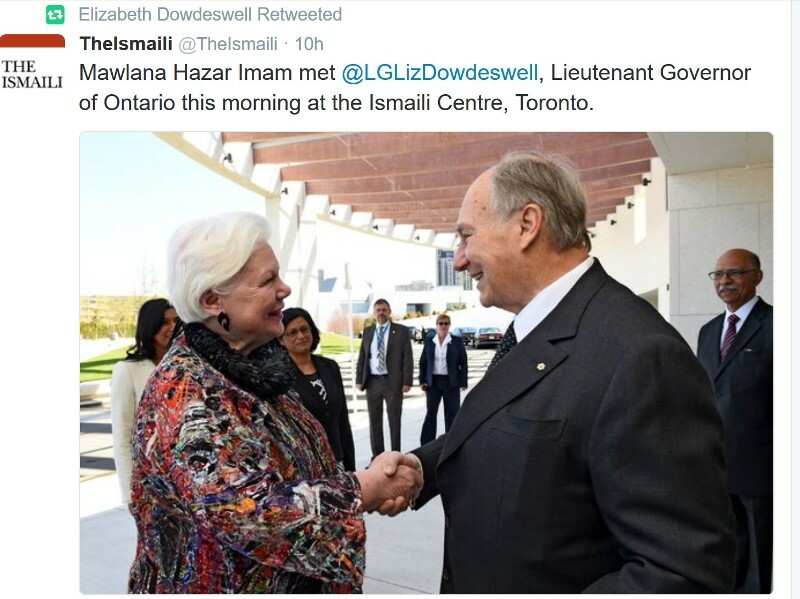 The Imam was there during the day with Princess Zahra and other Board members for a meeting.